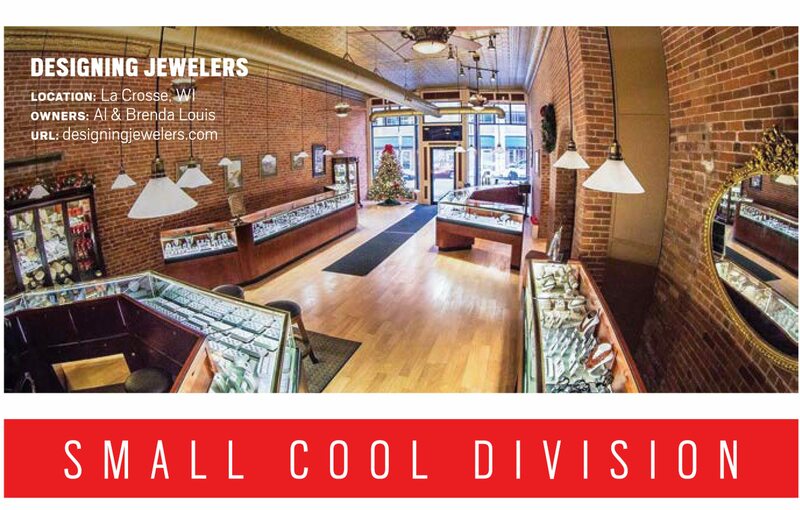 Designing Jewelers, La Crosse, WI, is one of several nationwide jewelry stores to be honored for Their Cool Factor! Designing Jewelers has been chosen one of “America’s Coolest” by INSTORE MAGAZINE, “The Magazine of the American Jewelry Store Owner,” in its 15th annual contest. The America’s Coolest Stores Contest highlights the best examples of independent jewelry retailers in North America. They are judged by a panel of retail experts on the basis of business practices, history, online presence, interior decor and curb appeal. The top three winners in two divisions split by the number of full-time employees are given trophies and featured in the August issue of INSTORE and at instoremag.com. Honorable Mention stores are featured as monthly Cool Stores in issues of INSTORE for September 2016 through June 2017. INSTORE has chosen Designing Jewelers as an Honorable Mention in the ‘Small Cool’ category and we are extremely proud to be representing La Crosse, WI on this national stage. Look for our feature in the October issue of INSTORE MAGAZINE, hitting stores in the coming weeks. Come down and visit Al and Brenda Louis (owners) and their wonderful staff and experience the ‘cool’ for yourself. Thank you for visiting our awards section. Please email us at al@designingjewelers.com with all inquiries.